My global investing and business began 41 years ago May 2, 1968 and eventually led me to Ecuador. My background as son of a zoo keeper did not leave me prepared. 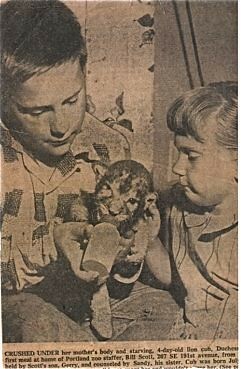 Here is a newspaper clipping of my sister Sandra and me feeding a baby lion we kept at home… one of many lions and tigers we raised. Let me share 41 years of multi currency investing and a couple of important facts I learned that may help you… including what’s happening with the swine flu in Ecuador. I arrived in Hong Kong in the night, the tropical air so soft it was a velvet mist. Thick evening scents in the fragrant harbor and mellow insects purrings in rhythm with the cacophony of the great city! What a an exotic adventure. Kai Tak was Hong Kong’s airport then and being American born and bred, I knew nothing about investing aboard. That was my first airplane trip, first time out of Oregon. Portland to Vancouver, Tokyo to Hong Kong. I melted in my heavy woolen blazer, was weary and afraid but excited too. An incredible global investing journey had begun… and continues to this day. Here I was, 21 years old. Here is the first stamp in that first passport. That stamp you might say was my first international investment. That first stamp makes a point by the way about how to enter and initially work or invest in a country. That first stamp was issued May 2, 1968 and allowed me to stay in Hong Kong until June 2, 1968. I worked in Hong Kong for quite some time on tourist stamps… coming in for a month at a time. I was developing sales teams in Japan, Korea, Taiwan, Thailand, Indonesia, Indonesia, Singapore and the Philippines at the same time so a month was plenty of time before I exited. 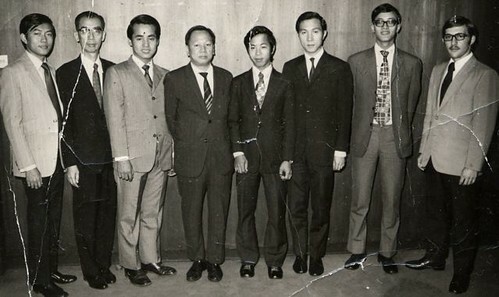 Here is one of my first sales teams… this one in Hong Kong led by John So Kwok Kee (far left – you can guess which one I am). I built teams from the north in Japan down through Thailand. One of the salesmen we worked with in Thailand, Brian Tracy, returned later to Canada and has had great success in the sales education field. Starting a business, investigation or residence with a tourist visa is a pretty good idea. This is usually the easiest, most efficient, practical way to begin so you can be sure what you are doing and how you’ll develop a more permanent stay if you want one. In many cases… such as mine… a permanent tourist system is simply the easiest and best. I began my business in Hong Kong this way and for years I also lived and worked in England on tourist stamps before obtaining my permanent residence there. A reader recently sent me this note about Ecuador tourist visas. “I spend less than 6 months a year in Ecuador. “We have heard from others who come stay for 90 days, leave for just a day or two (especially just over the border in Peru or Colombia) and come right back that there are difficulties. day visa. However we do not stress this system. For example we may stay 70 days and then be away for weeks or even a month or so. Then return for 20 days or so.. then leave for another month etc. The immigration officers look carefully at the total number of days by the end of the year and to help them, I keep a list of each day we have arrived and departed and the page number in our passport… so they can efficiently see we have not been in more than 180 days the maximum allowed on a T-3 tourist visa). Be careful not to overstay. One reader reported that having done so he was denied entrance upon his return and were not allowed to return to Ecuador for one year. We have a full report on Ecuador visas and an immigration attorney who helps our Ecuador Living subscribers. I am also preparing a report for Ecuador Living subscribers to answer this question from a reader yesterday. “Hi Gary, Wonderful timing, we had tickets to fly from Guadalajara to Quito yesterday, but were stymied by the fact that Ecuador (and Peru) are refusing passengers from Mexico. We understand Ecuador’s borders will be closed for a month to non-residents flying in from Mexico. We had thought about flying back to the States and then flying to Ecuador, but an electronic scan of our passports would show we’d been in Mexico and we’re not sure what would happen. Any insights? Thanks! You can obtain these reports and answers as an Ecuador Living subscriber. Learn how to subscribe to Ecuador Living here. Back to Hong Kong. I began there selling US mutual funds. When arriving there 41 years ago there is no way I could have known how exciting the next decades would be, how much information, facts, figures, ideas and insights on how to invest globally would be gained. Had I known the mistakes to be made I would probably have run! Then I moved east again to England and Europe… trying many things. Thankfully all the trials, tortures and errors were mitigated by much fun and an earnest endeavor to live right and learn. 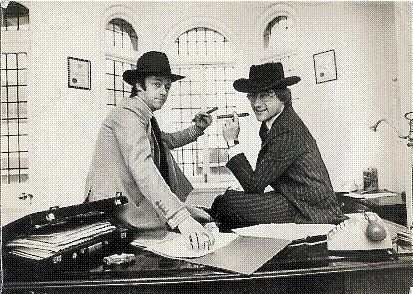 Here is a newspaper clipping of me with a business partner in my London office on Artillery Row selling square inches of Graceland… not really a very good idea. 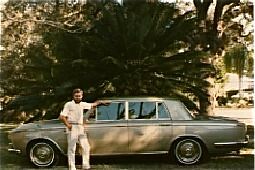 Later I imported Rolls Royces and Bentleys from England to the US… a better idea. One goal at this site is to share basics of global investing and living an international life learned over these 41 years. Global investing has changed so much during this time and is changing even faster now. I am continually forced to rearrange my thinking strategy and tactics at a faster pace. We offered health courses at our North Carolina farm. Here I am with our son, Jake, with one tactic we taught… a morning dip in a cold creek after exercise… yes that is snow on the banks and no… this not surprisingly did not sell very well either. 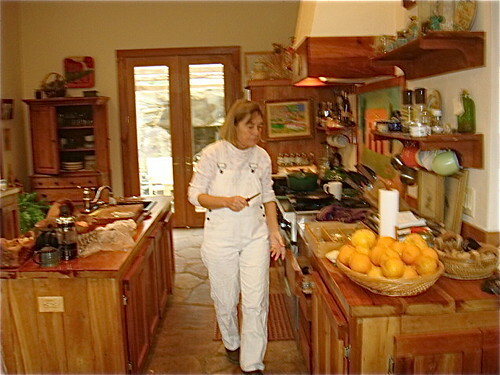 Our food as medicine courses taught by Merri in her teaching kitchen at the farm had better attendance! For almost 15 years now we have been conducting courses in Ecuador. 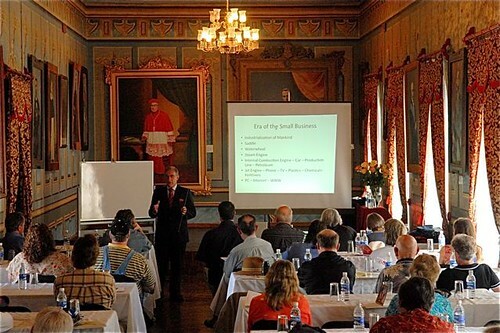 Here I am this year in the meeting room at the Cotacachi museum next to Meson de las Flores on an Ecuador export tour. This continual evolution has helped Merri and me, our readers and our income continually grow… through good times and bad. Yesterday April 2009 for example ended with anoter record month for our internet sales. Our 2009 sales (April month on month) were up 48.01% over April 2008, which in turn were up 24.04% over April 2007 sales. Our sales in the first four months of 2009 were up 81.75% over Jan through April 2008 which was up 26.20% over 2007. Learn how to develop an internet business that can grow like this here. The reason we have survived and progressed amidst this never ending update is that the little stuff shifts and evolves, but the fundamentals remain immutable. Investing globally is not a panacea, but expanded horizons are. Life is a trip and we have an entire globe to enjoy the ride. History suggests that this is a time when chances are increased for panic and sudden drops in investment markets. Investors who have proven themselves nervous short term thinkers are highly leveraged, in thin, over purchased markets that are easily sinkable boats treading the dangerous waters of May though October when tradition says the currents will most likely be treacherous and surrounded with lots of storms. Now, that this risk has proven true, history also suggests that we have a once in a life time opportunity. My first trip abroad 41 years ago was significant because 1968 was the beginning of a new era for world stock markets. When I arrived in Hong Kong the world of investing was dominated by Wall Street. That was about to end. 1968 was the year when the Hong Kong Stock Market began to explode upwards along with Tokyo’s market. What a ride! The Heng Seng Index was then 100 and rose to 18,000. Anyone who steadily committed money to this market then made a fortune. I can sum up my investment basic investing and advice in seven sentences. #1: 1970s. Invest in real estate, gold, silver Japan, Germany, Switzerland and Hong Kong. #2: 1980s. Invest in real estate, the Tigers, Japan, Taiwan, Singapore Malaysia and South Korea as well. #3: 1990s. Invest in real estate South America (which led me to Ecuador). #4: 2000s. Invest real estate, China, India and emerging markets including Ecuador real estate. #5: Always have an expansive view. #6: Use stop losses during peaks. #7: Have an international investment view. Never overextend. Don’t trade too much, just hang on. This philosophy has reaped millions for Merri and me. Had we been more expansive, we would have an extra $20 million or so. However our conservative approach to business and investing also protected us during the recent melt down of 2007 and 2008. This may be time to begin taking advantage of the recovery. Panic is subsiding but values are still high. The huge excesses of the US and other government’s will at some stage begin to seriously erode the purchasing power of currencies. I remain highly diversified from a currency point of view. Here is my current currency breakdown in my liquid portfolio that represents 43% of my total portfolio. With more than a third of my liquid position in Danish, Swedish and Norwegian kroner, my Scandinavian position is seriously over weighted in terms of global market size. One reason is because these are such small countries located on the sea. This means that their histories are composed of travel and trade. A nation’s heritage reflects in the value of its currency strength. This fact helped me answer this question from a reader. Most of the Danish companies you would buy are global companies. Because Denmark is such a small market any large Danish company is doing most of its business out of Denmark so a lot of their success depends on the type of business business and where the company actually manufactures and sells its products. Plus look at the margins built into the product. One benefit in Scandinavia is their very highly educated population. A recent Time magazine article shows that Finland (not Scandinavian but Baltic and Finland’s currency is the euro – otherwise I would have Finmark in my portfolio as well) ranked number one for educational performance of 15 year olds in math. Denmark was number 10, Sweden number 15 and Norway number 23… all ahead of the US (number 25). Finland was number one for reading performance of 15 years olds as well. Sweden number seven, Norway number 10 and Denmark number 16. The US was number 15. This means that the products produced in these nations will tend to be high value. For example, Novo Norsk makes insulin. I suspect that the margins are substantially high. Ditto for novozymes that makes enztymes for environmental purification. These are firms where there is likely to be a great deal of value added into their product. Vestas, makes wind turbines. and may be more affected by a strong kroner if they do a lot of manufacturing in Denmark but are having and sales in the US and especially if their competitors manufacture in the US or other countries where the currency is weak. I am updating the value of major and emerging markets now at multicurrencyinvesting.com and will be revaluing our green and Danish portfolios in upcoming lessons. You can subscribe to our Multi Currency Portfolios Course here. I have increased my Ecuador real estate to 22% of my total property. The balance is in US property and I am looking to add more US property now in Florida and or Savannah. If you have real estate in central Florida or Savannah that you would like to swap for real estate in Ecuador… let me know. Clinging to cash equivalents or long-term government bonds at present yields is almost certainly a terrible policy if continued for long. Holders of these instruments, of course, have felt increasingly comfortable – in fact, almost smug – in following this policy as financial turmoil has mounted. They regard their judgment confirmed when they hear commentators proclaim “cash is king,” even though that wonderful cash is earning close to nothing and will surely find its purchasing power eroded over time. Now is the time to convert cash into investments that will appreciate with the loss of cash’s loss of purchasing power… stocks… commodities… real estate or your own business. This leaves all of us with a lot to do after 41 years of a global life. I feel healthier and more energetic then 41 years ago. Maybe I am not wiser… but I am more experienced and seem in a better position then when I took that first trip. Merri and I look forward to the next 41 years… and we look forward to sharing them with you! This is the schedule of Gary our 2009 Ecuador information tours, courses and seminars.